The first 2/- value was produced in order to pre-pay double rate letters to America and the West Indies. The proposal was put forward on July 13th 1866, by the Postmaster General and after much discussion the job was undertaken and the presses began to run on April 10th 1867. According to the Post Office circular the date of the first issue was July 1st 1867 but an office at Hull issued a number of copies before this date in error. Earliest recorded is June 17th. The design was a new one and totally original, the Queens profile is on a lined ground, within an upright oval border inscribed ‘two shillings’ in the upper part and ‘postage’ in the lower. Within the angles of the rectangle are letter blocks which carry large white check-letters and the number of the plate appears within discs above the lower letter blocks. 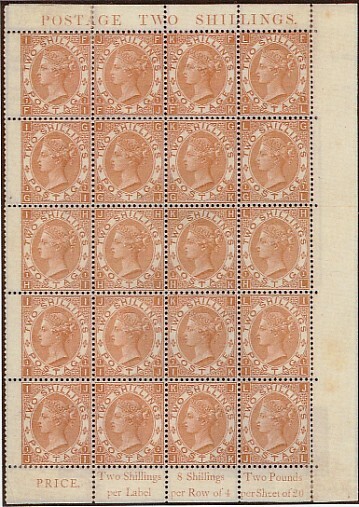 The WMK as with other stamps in this series was ‘Spray Of Rose’ and the printing was in blue. The colour varies considerably from very pale milky blue to a dark deep blue. A shade of Colbolt is also known, this is rare and under a UV lamp will show up as greyish lilac, quite different from the others if viewed in the same light. The 2/- blue was originally intended to be printed from three plates. The plate 1 layout consisted of 240 stamps contained within twelve panes of twenty. These were arranged in four horizontal rows of three, each pane containing five rows of four. Plate 1 had pulled just 2005 sheets before a defect developed, the plate was found to be out of square, causing big problems in perforating but this was soon rectified and printing was continued. One can just imagine the operators running down the cold work shop to fetch the foreman, the press hastily being stripped down to remove the failing plate. This would no doubt have been a rush job and work might well have gone far into the night. The improved plate being frantically replaced and the first pull made and inspected under gas light by hands stained with fine blue ink. There is a mention, although this is sketchy, that a plate 2 was laid down and finished at the time of the problems with plate 1. Apparently however this was destroyed around December 1867, the reasons are not clear but it is possible that the finished plate fell short of the strict controls and high standards required. No stamps or proofs of any kind are known to exist, although some have been printed. One month later, a third plate was finished and five trial sheets were printed and perforated but again for unknown reasons the plate was not used further. It is possible that demand for the 2/- was not as high as was first thought, plate 1 was certainly working well at this time and so the new finished plate was destroyed. A few copies showing the number 3 in design managed to find their way into use. These are very rare indeed. One mint copy only is known, this is in the Queens collection and a handful of used copies exist today. These are always in the pale blue shade, forgeries of the number 1, being altered to number 3, can be found but these are poor. We now come to the second and scarcer issue of the 2/-, this time in brown. England was now a member of the Universal Postal Union and certain values had to correspond in colour with their foreign counterparts. The 21/2d was the first to be changed from mauve to blue, the 2/- soon followed, plate 1, was again used and 1000 sheets were pulled. The first copies were issued on Feb 27th 1880. However in July, the post office decided to scrap the 2/- value due to the reduction in postal charges to certain countries. The with drawl took place in October, eight months after issue and 677 sheets were destroyed, so the total number issued was 77,620 stamps. It is interesting to note that the 2/- brown is considerably scarcer than the £5 orange (247,000) stamps. Jean de Sperati, the master forger of the early 20th century, turned his attention to this stamp. He obtained copies of the 3d on the same type paper, faded out the design with chemicals and etched a copper plate with very passable impression of the 2/- in relief and printed copies. These forgeries are GOOD and care is needed in sorting the genuine article from the fake. Basically the inked impression does not stand proud above the paper as it should in ‘surface’ printed stamps, but is perfectly flat and somewhat shiny. Also remember that the faded out 3d, looked like plain ‘used’ paper therefore the printing of the ‘new’ 2/- was OVER the PMK and not under it as should be the case with true copies. The fakes show the following check letters at base; JL, KJ, LK and PI. These fakes are collected in their own right and good copies are worth almost as mush as the real thing in average condition. There are other forms of fake, with great care the blue can be oxidised with chemicals into a dull brown. These don’t look too bad but the colour tends to go milky after a while. The 2/- blue is in my mind underrated and VFU CDS copies are scarce. The shades will form a neat album page, although colbolt could prove elusive. The 2/- brown is very scarce indeed and collectors are willing to accept it in almost any condition. In mint condition it is completely out of reach to all but the wealthy. Two shades are know, light brown and dark brown, but the first is thought to be a possible colour trial and has only been found imperfect. Copies in blue and brown are known OVPTD SPECIMEN, or cancelled, perf or imperf, with WMK inverted and imperf as singles or blocks. Another story on an interesting issue is at last told in full.